The Academy of Finland has nominated the new members for its research councils. 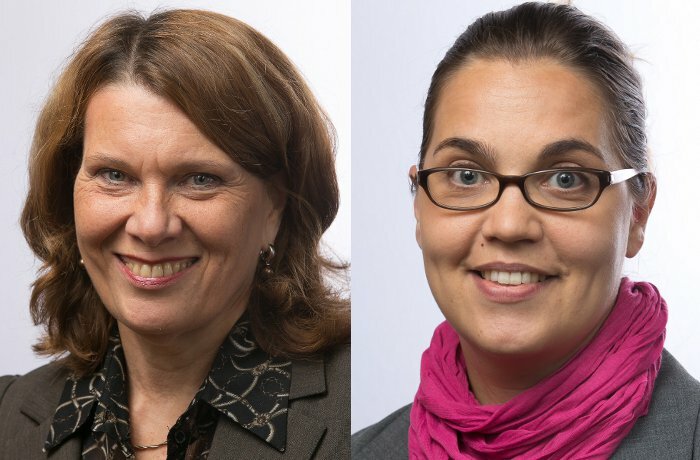 Tiina Sarjakoski was nominated a member of the Research Council for Biosciences, Health and the Environment and Heidi Kuusniemi a member of the Research Council for Natural Sciences and Engineering. The term of office will be 1 January 2019 to 31 December 2021. Professor Tiina Sarjakoski (left on the picture) is a research director at the Central Administration of the National Land Survey of Finland. On 1 June, Professor Heidi Kuusniemi transferred from being Head of the Department of Navigation and Positioning at the Finnish Geospatial Research Institute to become Head of the Digital Economy research platform at Vaasa University. Heidi still works for the National Land Survey, now only 10 per cent. The research fields within the Research Council for Biosciences, Health and the Environment are, among others, agricultural, forest and food sciences, which are the core competencies of the agencies under the Ministry of Agriculture and Forestry. Moreover, the research fields of the research council include research into the state of the environment, which is also researched at the Finnish Geospatial Research Institute of the National Land Survey of Finland. The research fields of the Research Council for Natural Sciences and Engineering cover extensively the core competencies of the Finnish Geospatial Research Institute. 'It's great that we have representation in two councils. It's a duty of honour to have the opportunity to influence the future of Finnish science,' says Sarjakoski. The last time professors of the Finnish Geospatial Research Institute were represented in the research councils of the Academy of Finland was in the 90s. Professor Juhani Kakkuri, the then Director of the Finnish Geodetic Institute, was a member of a research council in those days. The National Land Survey has never before had representatives in the Academy of Finland. As of the start of 2019, the Academy of Finland will have three research councils, which will carry out the Academy's tasks within their respective field. In addition to the aforementioned research councils, the Academy has a Research Council for Culture and Society.